As a distributor, J&H Berge, Inc. warrants that representations made for the products in this catalog accurately reflect the manufacturer's representation to J&H Berge, Inc. J&H Berge expressly disclaims all other warranties, whether expressed, implied, or statuary, including the warranty. In no event will J&H Berge, Inc/ The Lab Mart® be liable for consequential damages arising out of the products described herein. ALL ORDERS, AND CHEMICAL SALES Your order will be subject to approval before processing. To expedite this process, please obtain proper approval, authorization and any required licenses or paperwork prior to order submission. 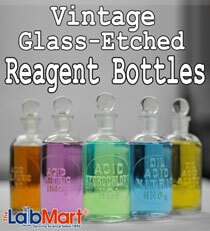 J&H Berge, Inc / The Lab Mart® will only sell chemicals to established organizations, not to individuals. We will not ship any chemicals to a residential address. We reserve the right to refuse orders and chemicals for any reason.